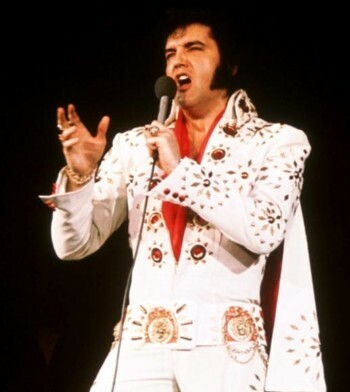 In 1972, Elvis Presley was still riding high from the commercial and critical rebirth that started with the ’68 Comeback Special and continued with his return to live performances the following year. His previous documentary, Elvis: That’s The Way It Is was a success, showing the King at the height of his physical and vocal ability. 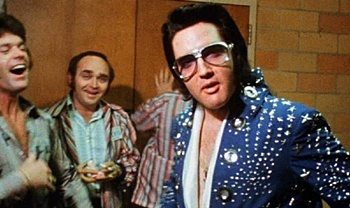 Hoping to recapture some of that magic, directors Robert Abel and Pierre Adidge followed Presley on his 15 cities in 15 nights 1972 tour, the results of which became Presley’s 33rd and final film, Elvis On Tour. Long out of print on VHS, it makes its DVD and Blu-ray debut with this release. 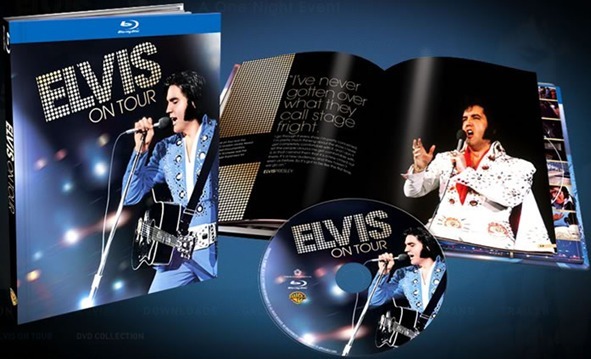 When EIN first asked me to do a review of the BlueRay version of Elvis On Tour, I said yes, of course I would do it, but it would be over 3 weeks before I received my copy. In those 3 weeks, I changed my mind about doing the review at least a dozen times, because I had watched this movie at least 50-100 times, and I didn’t think I would see anything new. But, I had already told him I would do it, so that was that. Before I start, I just want to point out that my television is a Sony Bravia HD TV and the BluRay player is an LG. I have no surround sound. So, I put the disc in the player, settled back in the chair with a pen and paper, and turned it on……..for the first 10 minutes, I didn’t write a thing, I was stunned. I soon realized that I was seeing something completely new and different. It was of course the Elvis On Tour that we all know and love, but this?….well, I am going to have difficulty with this review, but not for the reason I first thought. I am going to have to write this as though I have never seen this movie…. I am going to have to write this as if seeing it through new eyes, because that is exactly what Blu Ray is. I am not going to do a review of each song, because fans already know the songs by heart…it’s just now we are seeing and hearing them in a new light, and that’s what so great about BluRay….it makes me wonder what the next generation of film and sound technicians are able to do. The video quality to these eyes, is so much of an improvement over what I have seen previously. It's crisp and clear and the detail on the jump suits was the one thing that caught my eye over and over again. Elvis opens the movie talking about his father. Vernon was, it seems a little apprehensive about Elvis’ music…..it seems he would have been happier if Elvis had finished his Electricians ‘apprenticeship’ before he started his ‘playing the guitar’, but aren’t we all pleased that Elvis didn’t listen to his Daddy…..as it turned out, this guitar player WAS worth a damn….. The opening montage is fantastic…the colours and the sound are what you would expect if you had been in the audience. The replacement of Johnny B. Goode with Don’t Be Cruel is something that we as fans have found difficult to accept, but it’s there, so we just have to get past it…..It would have been good if they had found a song though that they didn’t have to loop. At the end of the day I was happy that I already knew that Johnny B. Goode wasn't to be used in the opening credits, it gave me time to 'get over it', - but still the dissappointment was there, and I don't think fans are being too picky. After all, this was a kick-arse section of the whole sequence. The 'no extras' was also a bit of a downer. As I said, how can they leave out 'buried in a beaver'.....they had 'before I kick your arse' during Don't' Be Cruel, so our sensibilities weren't taken into consideration for that to be used. Jackie Kahane starts us out with some jokes, (and I use the term lightly) but everyone in the audience was already in a good mood, so he received the laughs anyway. Elvis and the entourage walk into the dressing room, early as it turns out and Elvis is nervously pacing…… the picture is a bit grainy, but the audience shots are very clear. 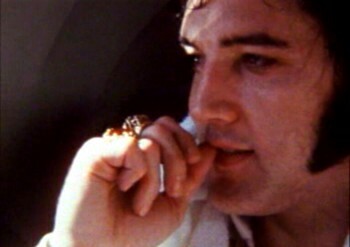 If Elvis was not as healthy as he could have been, it's not evident in the BluRay version, he looks and sounds great. 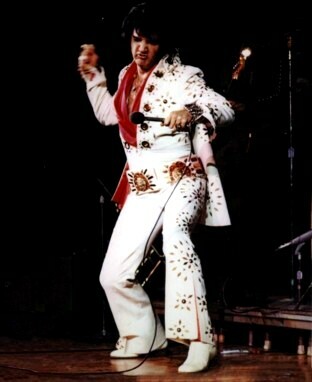 I think the performances during the concerts of Elvis On Tour may have had some bearing on what the producers and film makers wanted to do with the Aloha Concert. 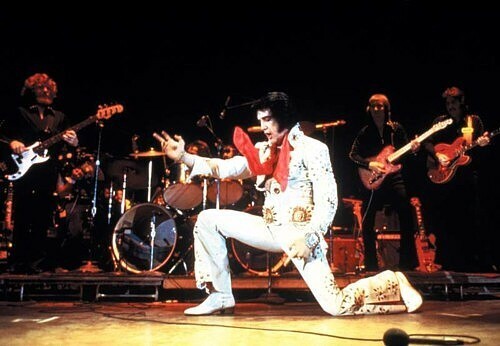 Was it difficult to catch Elvis' every move during Elvis On Tour? I think it must have been, because we see Elvis almost stationary during Aloha..... but I am not by any means comparing these two films/concerts. Elvis was all over the stage during the filming of EOT, whereas Aloha was a directed and detailed choreographed exercise. We need to bear in mind whilst watching this film is that every show and every shot of Elvis is filmed in a different light each time…. probably different cameras were used, and at all different angles, so any consistency would have been impossible for the film makers. The book that came with the BluRay DVD is not really worth the extra expenditure. Although it is produced using good quality paper, a good sturdy cover, the photographs are ones we have seen before. To be honest, I haven't really taken a great deal of notice of the book, just a quick glance because I thought they might have included an actual listing of each song with whichever concert it was taken from, but this isn't the case. I know these details can be found elsewhere on the Internet, but it would have been a good opportunity to have them listed with the actual movie. We shouldn't be surprised that there are rumours of another full release being done in 2012. This has happened to us time and time again...you would think we would learn, but the Elvis fan is getting a bit older and I for one often wonder if I will have the disposable income in the future to purchase and further releases. Elvis sings ‘here we go into the wild blue yonder….." I had never heard this before. The car personnel have a little sing a long…. Then Elvis goes into a thought mode…..what was he thinking? Was he remembering things just as the film makers have chosen to show us? The black and white montage takes us back to the beginning, and the black and white photographs now shown with the BluRay technique are just as spectacular as the coloured parts of the film. Once one of the shows is getting ready to start, an announcers says…..’please remain seated and do not congregate at the edge of the stage’…..good luck with that. This was part of the film that really made me sit up and take notice…some shots have been taken out of some of Elvis’ other movies…..and the appearance of these scenes are so clear….these movies were made in the 60’s…. but they are just so clear…..do I now need to go and purchase these movies in BluRay…….? Probably yes!! Did anyone else pick out where the roadies are not happy? They must be tired. There’s a lot of folks out there……. 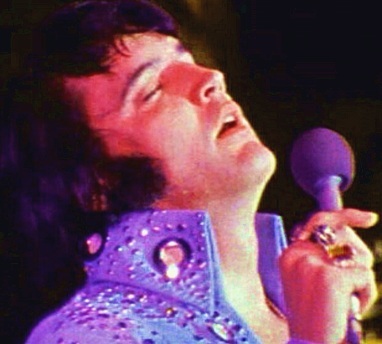 and who gets the ring that Elvis so casually throws out to the audience? From Gospel to Rock in less than a minute……MAGIC…..
Once again, we come to the end of an Elvis concert…..but boy, what a ride!!!!!!! Overall Verdict: I suppose I was a little disappointed with the release because of the lack of extras and the non inclusion of Johnny B. Goode, but not disappointed enough to boycott the release (as some have suggested!). There is no doubt that Elvis fans will really enjoy the upgrade of this release on BluRay due to the great improvement in visual and audio quality, but it should come with a warning..... "After viewing this release, fans should be warned that they will want to purchase everything they already have once again, only this time using the BluRay format." 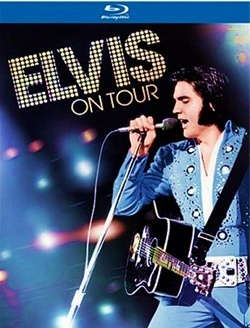 Go here for EIN special review of the ELVIS ON TOUR cinema presentation with lots of Elvis pictures.